One of the most helpful books I have read to explain what I am observing in Cafechurch is A Churchless Faith, by Alan Jamieson. I think it is a really helpful model of what happens to people as they come out of what he calls EPC (Evangelical, Pentecostal, Charismatic) churches. It is interesting, not just because it explains a lot of Cafechurch’s life over the last ten years, but because there seems to be a lot of noise on the interwebs by people angrily leaving, and equally angrily defending, EPC churches. I’ve been been particularly struck by how lively the Stuff Christians Like Facebook Page is. I’m not an active member of this group, though I may have posted a couple of things there. So this is my little contribution to the conversation. I hope it might bring a little light to what can seem like a dark, angry place sometimes. Cafechurch has been on a journey which is remarkably similar to the one Jamieson describes, and so I will interleave reflections on our story among Jamieson’s stages. Jamieson researches the story of a number of people who have left EPC churches, and detects certain patterns in their trajectories. It is well summed up by the following diagram. The first group, who he terms “Disillusioned Followers”, have left because of particular complaints about the church. Perhaps there is a new pastor who you don’t like, there has been some messy falling out with a cell group. Something like that. This group will probably still be part of the evangelical world, listening to Christian radio, reading Christian books and blogs, and so on. Jamieson characterises this group as being “dependent” on the Evangelical world. They are not rethinking their faith – their discontent applies to a specific set of issues within a specific church. They are very passionate about their faith, even as they are angry with their particular church. This group tends to either move back to EPC church, or move onto the next group to be discussed. The second group he terms “Reflective Exiles.” This is a stage characterized by deconstruction of the faith which the person has received. Everything is up for grabs. No matter how this started – with the particular problems with a specific church of a Disillusioned Follower, or with a gradually increasing sense of a lack of fit between faith and life, This ongoing period of deconstruction moves from the peripheral towards the very core elements of faith – like the question of whether God exists at all. It is “ongoing” because it can take a long time, and isn’t amenable to external timetables. They are examining the very basis of their faith, and everything which was once received unquestioningly is subject to criticism. It is hesitant because everything which was once certain is now uncertain. While Disillusioned Followers are still deeply immersed in Evangelicalism, Reflective Exiles are strongly reacting against it. They generally stop reading the Bible and having a regular time of prayer, because it doesn’t feel real to them anymore, and because it represents something which they are reacting against. In my experience in Cafechurch, this is a time of strong emotions. Beyond the presenting questions (so what about prayer then? What about suffering?) I think there is deep mourning going on. People are engaged in an extended death of part of themselves. Their faith has been such an important part of their identity that to let it go is to die a sort of death. There is also a lot of shame involved, as people question themselves for holding beliefs which now seem absurd (do all non-Christians really go to Hell? ), as well as blame for the institution which they hold responsible. It can be a very long process, and iti s hard pastorally, not just because of the strong emotions, but also because these are people who already know the easy answers of faith, and are rejecting them. It forces anyone who is trying to help them deep into their own questions and doubts to reach for what is really real for them. The next group (Transitional Explorers) represents a change from deconstruction to a tentative reaffirmation of faith – but not a faith which takes the whole package as a job lot. Instead, it takes elements “That have now been tested and found to be valid and worthy of being retained to the level of satisfaction necessary for the individual involved… the internal jury sees them as being plausible ‘beyond reasonable doubt. '” It is tentative, and accepting of the role of emotion and intuition. It marks the turning point from being an exile to the possibilities of moving forward. Jamieson characterises this group as being “inner-dependent.” It is my take on faith which counts – self ownership of faith (inner-dependence) is their primary characteristic. While the previous group were deconstructing and subjecting everything to hard questions, this group is beginning to rebuild, to see that there is something valuable here after all. In Cafechurch, this has been a bit of a gradual thing, and I find it hard to put my finger on. It is made more complex by the degree of change in the group. Have people journeyed together? Or is it more that the people who now come were already in this stage? Or perhaps a little of both? No matter, there is definitely a change. I can remember a time, perhaps five or six years ago when people were very unkeen on calling themselves Christian. I feel like that stage went on for a good few years, gradually easing off over time, but it is hard to draw exact boundaries. There was certainly a point at which it felt possible to introduce regular Bible reading to the group (which is our current practice), which would have felt very foreign to the group a few years ago. The final group which I’m going to outline is Jamieson’s Integrated Wayfinders. This group is marked by a growing confidence in their faith, which can seem similar to that of members of EPC churches. However, Jamieson describes two key differences: firstly that the grounding beliefs have been subjected to the criticism of the previous two stages, and found reliable; and secondly, openness to the idea that truth can be found in other faith traditions and philosophies, in contrast to the rigid them-and-us thinking of the Disillusioned Follower. The inner-dependency of the Transitional Explorers gives way to inter-dependency. We are wiser when we are thinking together – faith is a journey, and as such, best undertaken in company. In the Cafechurch scenario, I think this is increasingly where we are. I base this on the enthusiasm with which people have embraced our contemplativey-worshippy thing we call Caravan, and the interest in spiritual development. We aren’t sure what church should look like in our world, but we are starting to think we might be in a position where we might be able to explore it together. 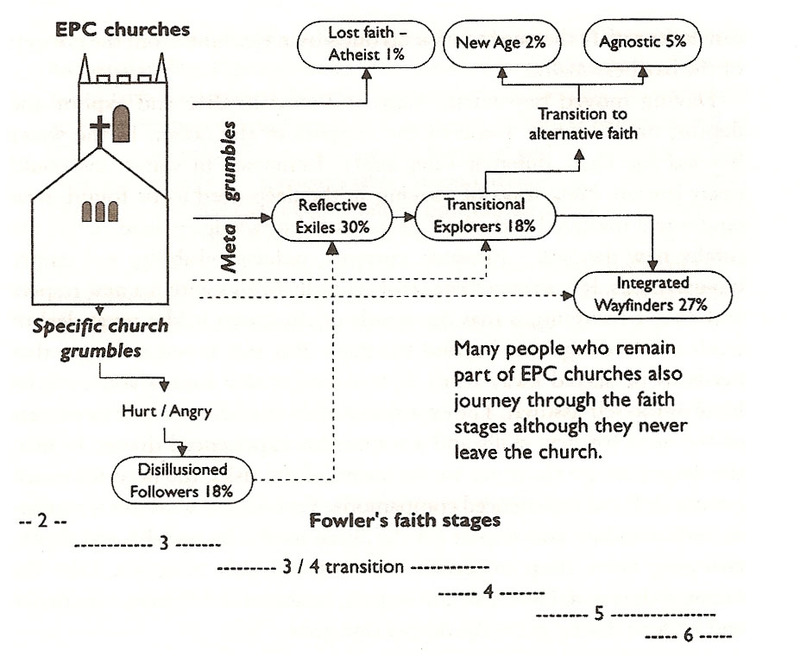 So that’s how I see Cafechurch’s journey, and how it relates to Jamieson’s Churchless Faith. The observant will note that I haven’t addressed all the possible destinations – atheist, new age, and agnostic, nor people who return to EPC church. This is because I am telling Cafechurch’s story, and if people feel that they have stepped out of Christian faith altogether, they also tend to stop coming to Cafechurch. They have their stories, and it’s a long journey, so just because someone is an atheist now doesn’t mean that’s their final destination. It’s a great little book, and I really recommend reading it if this area is interesting to you. Finally, please be careful how you use this schema. It shouldn’t be used to beat people over the head and try to push them further than they are prepared to go. The Reflective Exile stage is extremely hard work, a huge psychological adjustment for some people, and they are often very very very angry. I have sometimes been a bit unwise in how I have talked about faith stages like this and damaged relationships. It’s powerful juju, so use with care. And very, very finally, Jamieson is at pains to point out that people can grow in faith within EPC churches, just as they can outside. This is not supposed to be an invitation to yet more innies vs outies talk. There are some good explanations on the stages of faith in this article. It’s good to be aware that there is a typical human reaction to leaving or joining a church no matter what denomination it is. This article shows some of the dangers of tracking too far off course and where that can lead.